We just watched Horatio’s Drive: America’s First Road Trip, one of Ken Burns’s shorter documentaries. It recounts the story of Horatio Nelson Jackson, a Burlington doctor who made America’s first cross-country trip by car. He didn’t do it for money or publicity; Jackson was a car enthusiast who, in 1903, made a bet among gentlemen in San Francisco that he could drive from San Francisco to New York in 90 days. Two professional teams set off shortly after Jackson and Crocker (a chauffeur/mechanic), but the amateurs made it first, in just 63 days. I was touched by the presence of Bud, their animal companion. Jackson seems like a pretty impulsive guy; at some point during this grueling trip over dirt roads in an unreliable car, he decided to buy a bulldog. He named it Bud, and Bud accompanied Jackson back to Vermont where he lived a full doggy life. Think about how lucky this dog was. He was the first dog to go on a proper road trip–30 miles an hour, head over the side, tongue hanging out, ears flapping in the breeze, staring at cattle or trees or farmers or birds or just nothing at all. Why has this not been made into a road movie yet? It’s got plucky amateurs against the big money candidates, danger from storms, deserts, cliffs, and hunger, two friends and a cute dog, colorful locals–everything! 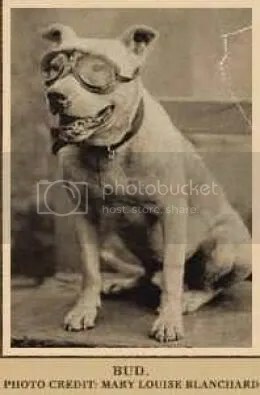 Plus, Bud got to wear dog goggles. Where the heck did they find dog goggles, anyway?